The Walmart greeter is a staple of the store, and arguably the best part of going there. Being a Walmart greeter is a particularly attractive job for folks with disabilities as it has fewer physical requirements than other such jobs do. That's why it's so horrible that Walmart has changed the role to effectively weed out any disabled folks from doing it. Will you sign the petition to tell Walmart not to discriminate against their disabled employees in this way? Jay Melton lives with Cerebral Palsy and has worked as a greeter for over 17 years. 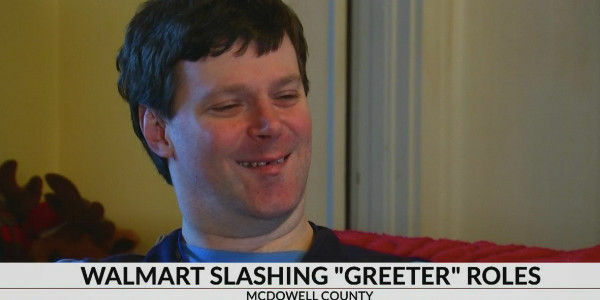 It's been a great job for him, but now he's going to lose his job because Walmart is changing the job requirements in such a way that Jay will not be able to meet them. Marcus Romer is another man at risk of losing his job with these changes. What both of these men have in common is their enthusiastic and happy attitude, which is the main requirement for a Walmart greeter! But now Walmart is changing the role to include some really intense physical requirements, no doubt in order to squeeze more labor out of their employees and weed out disabled folks. The requirements are things like lifting 25 pounds, chasing after shoplifters and standing for long periods of time, all things that will be difficult for folks with disabilities, thus forcing them out of the position. Jay and Marcus are not alone in the threat of losing their livelihoods — greeters across the country, are about to lose their positions. This is a shrewd and cruel business move on the part of Walmart that is going to have substantial costs to individual people. Ironically, March is Cerebral Palsy Awareness Month and it's the month many greeeters with Cerebral Palsy will learn that they are losing their jobs. Many of these people have few other job choices and love their work greeting folks at the door. They have personal relationships with shoppers and bring a mood of welcome and happiness to each store. It's beyond unfeeling that Walmart is going to take that away from people just because they are disabled — in fact, it's unethical. Please sign on to ask Walmart not to make this discriminatory change that will cost hard working people their jobs.